Google has recently released a new updated version of its Google Voice iPhone application. With this new update, Google is trying to offer the same features that its Android users enjoying already. The new version pushed by the search giant is 1.4.0.2372. It sports multi-recipient texting with contact autocomplete. 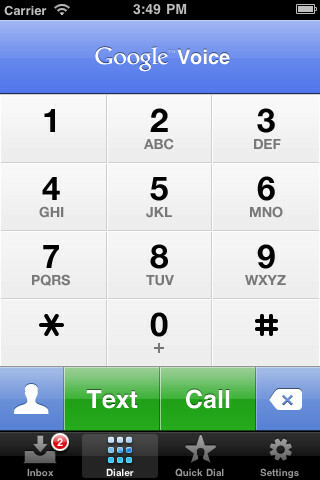 Sprint integration support, a multi-line text entry field and 1-touch copy and paste in the dialer. It is certainly a welcome update by iPhone users as it has finally been raised up to speed with its Android equivalent. Contrary to iPhone app, Android users have been enjoying the multi-recipient texting for over a month now. However, with recent update iPhone users will also be able to use new features of Google Voice in their handsets. It is worth noting here that the service is still available in the United States only. The update has something worth for Sprint iPhone users as well. They can now “send all calls to the native dialer when the phone is integrated with Sprint.” This is certainly an amazing featuring considering the recently launched iPhone 4S. It is the first Apple smartphone that Sprint has offered to its customers. Where every user wants to have this update, some users have been reporting problems with new update. If you have not got updated to new version, we prefer you to hold off for a little while before Google addresses these issues.